The slates have been removed from the original German Warehouse to allow repairs to be made to the roof structure. While the oak roof trusses are sound the horizontal purlings have had to be replaced and the precision craftwork of our joiner Hugh McMahon of Mona Join Ltd had to be shared through these images. The joints between old and new show the skill of a master craftsman and the beauty and strength of the wood will remain exposed as a feature in the top floor penthouse apartment. The building generally is in good condition and site manager John who has worked with us on many historic projects gets quite poetic when describing the process of making it sound again. “It’s like helping an old friend that’s got a bit tired. We are just giving it a hug, making it straight and right again so it can go on for another hundred years. It’s a lovely thing to do, to save a building.” He is an Irish romantic. 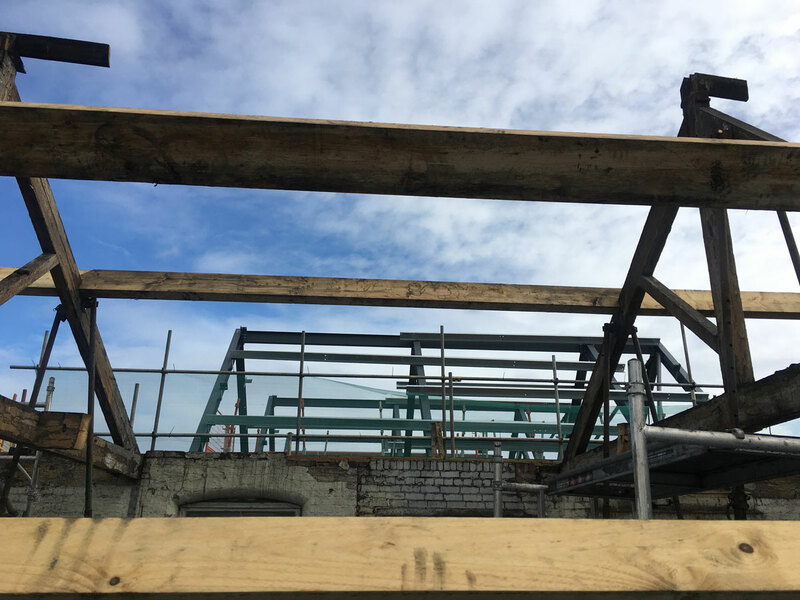 Through the trellis of the old roof you can also see the steel apex of its new neighbour taking shape and we can report that the views from here down George Leigh Street out across the Ancoats roof tops is very special.